A decade after the release of the first Galaxy S, Samsung is launching the sleek and Pantone color of the year– inspired next generation of its signature smartphone. Meet the Galaxy S10e, S10, S10+, and S10 5G, announced today at Unpacked in San Francisco. The line consists of models ranging in size and price with better-than-ever displays, cameras, and AI-powered capabilities. 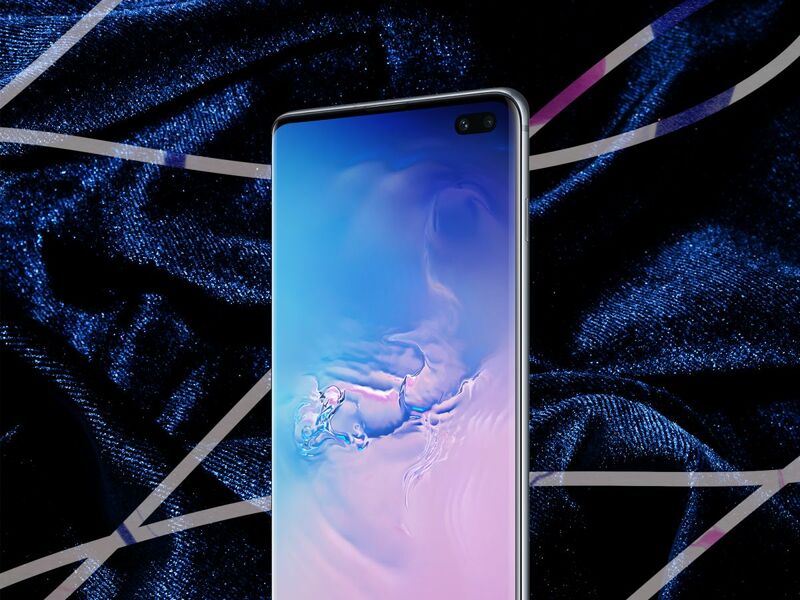 The S10e is the most basic and inexpensive of the bunch, with a flat and compact screen (compared to the curved screens of the other models), a 5.8-inch display, and a dual camera and front camera. One tier up is the S10, which has a triple rear camera and a slightly larger 6.1-inch display. And then there’s the 6.4-inch S10+, which comes with more storage and a dual front camera in addition to its triple rear camera. Lastly, the 6.7-inch S10 5G is Samsung’s first foray into 5G, the next generation of mobile connection with the fastest speed available, which will only be offered on Verizon and Sprint. While these aren’t the most creative names (if they sound similar to Apple’s past models, it’s because they are), what’s more important is their unique hardware. With each of these new devices come a lot of bells and whistles, including improved speed, security, intelligence, enhanced gaming capabilities, and new pretty colors. Samsung has already proven itself as a formidable leader in the camera space, but perhaps the most impressive update to the Galaxy is the camera’s new ultra-wide lens, which has a 123-degree field of view. (Toggling between the standard lens and the ultra-wide really changes the scene captured, with the lens encompassing basically everything you can see within your naked eye’s 120-degree field of view.) It’s the perfect camera setting for when you’re herding the group ’round the Thanksgiving table — and will definitely require fewer people to kneel in the front or scoot their chairs closer together. The camera is also AI-powered, with an improved scene-optimizer feature that uses a neural processing unit to recognize scenes and select the best photo settings for them. There’s also a shot-selection feature that suggests photo composition — handy for the budding photographers among us. New to the S10 is its in-display fingerprint scanner, which reads your 3-D thumbprint with highly secure biometrics authentication for extra security. It also has an in-display camera that blends seamlessly into the screen without disrupting the on-screen picture quality. The range also reduces blue light, making the display easier on your eyes. The S10 is Samsung’s most intelligent device by far, and perhaps the coolest of the new super-smart features is Wireless PowerShare, which lets you share your smartphone battery juice with any other Qi-certified smartphone — perfect for when you’re out with a friend and their phone dies. Theirs doesn’t even need to be a Galaxy. Wireless PowerShare can also charge a second device in tandem while you charge your phone with a standard charger, and it can power wearable devices like the new Galaxy Watch and Galaxy Buds, also announced today. The S10’s AI assistant, Bixby, adapts to how you use it, opening apps for you and providing recommendations based on your daily routines. It also analyzes your habits to optimize the battery, CPU, RAM, and device temperature, which makes for a longer, 24+ hour battery life. The Galaxy S10’s price tiers are right in step with Apple’s X lineup. The most basic model — the Galaxy S10e — starts at $749.99. Next up is the Galaxy S10, starting at $899.99. And the most expensive is the S10+, which starts at $999.99. As far as color, all three are available in Prism White, Prism Black, Prism Blue, and Flamingo Pink, inspired by the Pantone color of the year. And the Galaxy S10+ is also available in Ceramic Black and Ceramic White. You can preorder all three models beginning February 21 at 12:01 a.m. ET. Also, if you preorder a Galaxy S10 or Galaxy S10+ between February 21 and March 7, you’ll get a free pair of Galaxy Buds thrown in. And if you trade in an old Samsung device, you can receive up to $550.18 toward your purchase. But before you drop one of these into your shopping cart, keep in mind that Apple is reportedly dropping a new iPhone with three cameras later this year. I didn’t know my phone needed so many cameras, but now I’m never going back to just two. Will The Real Lamar Odom Please Stand Up! Yikes! What Happened To Johnny Depp? How Does a Millionaire Discipline His Kids?